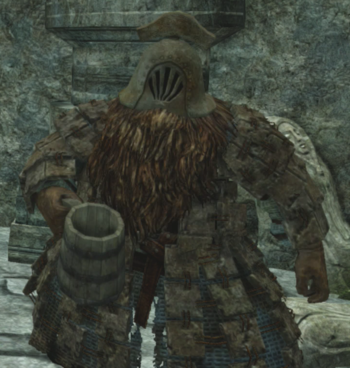 A traveling Gyrm merchant with a short stature and huge beard. Dark Souls II: Found upstairs in a building far up in the wharf with many Dark Stalkers. He appears here first and will leave after being visited here to go to Harvest Valley. Dark Souls II: Scholar of the First Sin: In the room next to the movable portcullis, where you can summon Lucatiel of Mirrah. If you kill him there, a gravestone will be at his place. With 3,500 Souls you can call his ghost and trade with him. Found in a small room on the left side of the dug out burrow, beside the first encountered Mounted Overseer near the Poison Pool bonfire. He will leave after being visited here to go to Doors of Pharros. He will stay here permanently. He is found in the room, up the stairs outside of the Gyrm's Respite bonfire. His stock of items is unlimited here. Allows players to sell items to him in exchange for souls. 7,000 Increases Poise by 10 points. Only in Doors of Pharros. Poison Arrow 20 60 Arrow that inflicts poison damage. Poison Moss 20 1,500 Reduces poison build-up and cures poison. Poison Throwing Knife 20 350 Throwing knife coated with poison. Rotten Pine Resin 20 2,000 Apply poison to right-hand weapon. Once he has reached Doors of Pharros, his stock of consumables and ammunition will become unlimited. Gifts you a Gyrm Greataxe after spending 16,000 souls. You can buy a total of three Ring of Giants as he will restock his inventory when he moves to his next location. But since you can't wear more than one at the same time, it's not worth it. Infused and/or upgraded weapons are sold for the same price as the base weapon. Key items, covenant rings and unlimited-use consumables cannot be sold. Items obtained from the Dark Souls 2 Black Armor Edition can not be sold. Gavlan want soul. Many many soul. Gah hah! With Gavlan, you wheel? You deal! Gah hah! Oh Gavlan, know you. What you want? You, again. Gavlan, meet you again. With Gavlan, you deal. Much, much deal. These, you take, ah For you. Many deal…many thanks! Gah hah!